Sometimes in the early days of recording, companies would temporarily change the names of certain bands on their releases, possibly unbeknownst to the performers themselves. Often it was to appeal to a different cultural market, and this happened in particular with Eastern European instrumental tunes, as with an instrumental there was obviously no language issue to prevent cross-marketing. For example, I’ve seen Slovakian bands renamed as Lithuanian bands, and their instrumentals re-pressed in a company’s Lithuanian series. Many tunes that were ostensibly Polish and issued in a company’s Polish catalog, were re-pressed in a Ukrainian series and added to the Ukrainian roster – and vice versa. And the same with “Russian” discs, “Lemko” instrumentals – the list goes on. It was kind of a mess, when you look at the data, and it happened frequently. Luckily, discographers such as Richard Spottswood spent years figuring these details out, looking at ledgers, cross-checking information, and thus solving a lot of mysteries. Interesting, then, that this record was not issued as being by the Manahoy band, and instead issued as the Shenandoah Lithuanian Miner’s Band. This was not a cross-cultural marketing technique. The town of Shenandoah and Manahoy City are only about 2 miles away from each other, and both were mining towns with significant populations of Lithuanian immigrants. 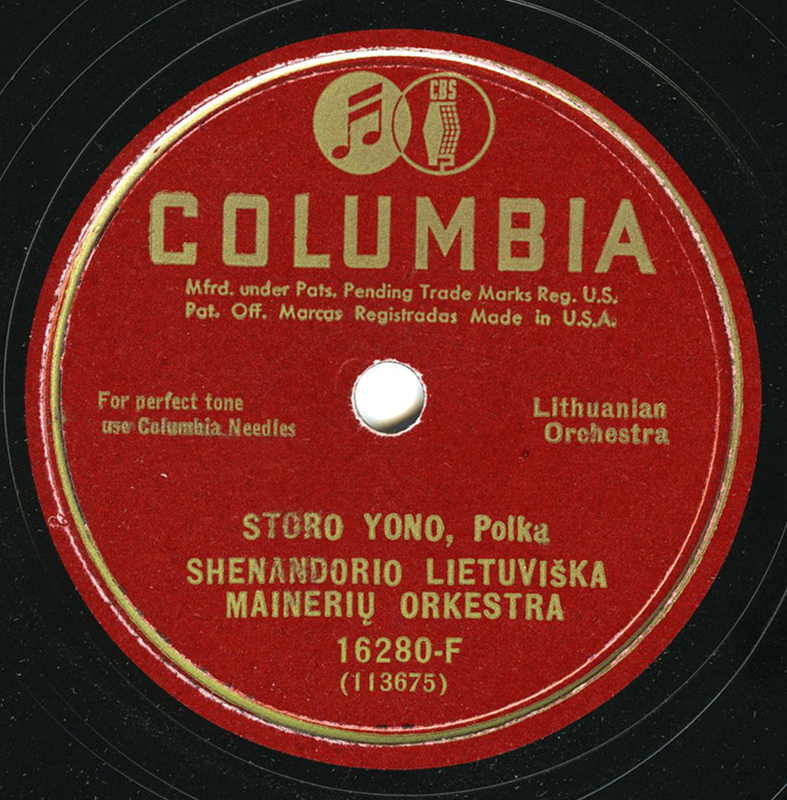 The Manahoy band had records issued as the “Lietuvių Tautiškas Orkestra,” the “Polish Novelty Orchestra,” the “Russian Novelty Orchestra,” and they even issued a disc titled “Shenandorio Polka.” One wonders why the small geographic change. Perhaps because the towns are so close to one another (Shenandoah is in fact technically part of West Manahoy Township) it was understood by locals to be the same band! For more traditional and often rural Eastern European music made in the 20s-30s in the US by immigrants, check the Resources page under Ukraine, Poland, Slovakia, and Slovenia. oh, cool! I went to Mahanoy City’s Historical Society last summer looking for info on Yotka (Yotko) this past spring looking for more info on him. (Some descendants seem to still be there, although their name is spelled differently now.) I didn’t learn much else, but I do know that we was born March 10, 1895 and was from what was then “Vilna, Poland” (now Vilnius, Lithuania) and directed several coal-miner’s bands on record between April 1928-March 1933. (Amazingly, his name and none of the bands’ names appear in local papers of the time. Their performances were strictly word-of-mouth, it seems.) I’m delighted to hear this one I’d never heard before. (An exhibit I visited on local Lithuanian culture was, at the time, on show at another local museum in Pottsville – home of Yeungling beer! – just a few miles away.) Thanks! That’s fantastic, Ian – thanks for the info, too! 100 sides – amazing. Excellent – I will also add the Widow’s Joy LP to the Resources page, stat. Lovely! A propos of a previous discussion, there’s nothing wrong with that red Columbia!